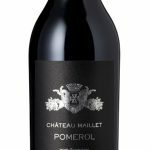 Pomerol, Château Clinet 2015 is a blend of 90% Merlot, 9% Cabernet Sauvignon and 1% Cabernet Franc. Cropped at 37 hl/ha and matured in 65% new oak. Picked from 15 September commencing with the young Merlot vines, and finishing between 28 and 1 October with the very old Merlots and the Cabernets. A couple of specific features to note: the alcohol level is 14.3%. Perhaps a little lower than some of Clinet’s peers and also a IPT of up to 88, higher than 2010 even. Broody at first, it eventually develops a perfumed bouquet as it opens, with black fruit, melted tar and a brush of black truffle. The palate is medium-bodied with fine tannin. There is plenty of nascent energy in this Clinet, spicier than other vintages that I have tasted over the years, linear at first and then fanning out towards the finish with a dash of white pepper on the aftertaste. 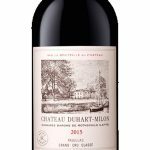 It is a very harmonious Clinet, one that I suspect will favor those with the nous to age this Pomerol for 5-7 years, even though it might tempt you earlier. Drink 2025-2050. OMG. This is really dense and rich with velvety tannins and so much fruit and length. Super concentration and structure. Greatest Clinet ever. No jam. Just class. The 2015 Clinet is an exotic, totally arresting beauty. Powerful, unctuous and inky to the core, the 2015 exudes richness. There is nothing subtle at all in this full-throttle, towering Pomerol. And yet all the elements are very nicely balanced. Blackberry jam, crème de cassis, licorice, graphite, dark spices, licorice and bittersweet chocolate are fused into rich, port-like finish. The 2015 is a bit extreme, but it is also compelling. The blend is approximately 90% Merlot, 9% Cabernet Sauvignon and 1% Cabernet Franc, while new oak is around 65%. The Clinet is unusual in that the Cabernet portion favors Cabernet Sauvignon over Franc. Tasted two times.